How do people get to the station? Last week’s Age reported that Metro proposed multi-storey car parks at some stations. When it comes to how people get to the station, Park And Ride gets a lot of attention, probably because it’s so obvious. In terms of land taken up, car parks often dwarf the stations they serve. But it’s important to remember that park and ride doesn’t actually cater for the majority of train travellers. The PTV’s station patronage data is a couple of years old, but it shows that even in zone 2, where feeder services are often lacklustre, park and ride users are in the minority, though it is a sizeable minority. 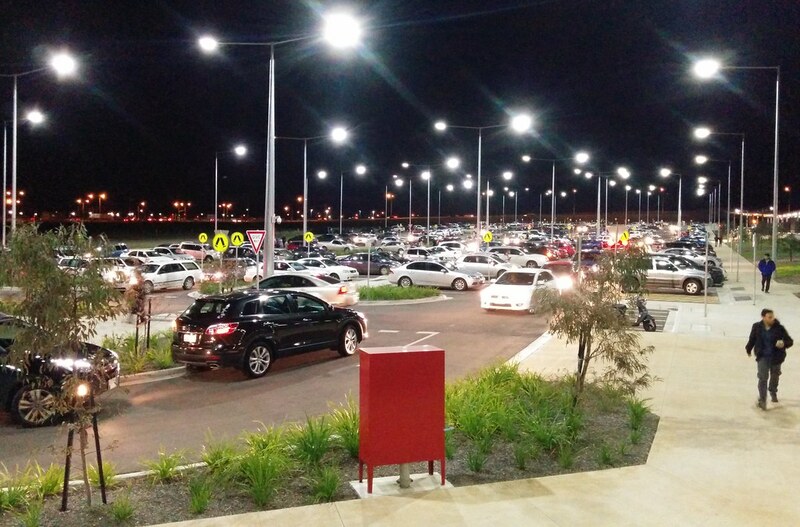 Of course, the number of park and ride users isn’t always limited to car park spots at the station. Often they fill local streets, causing headaches for councils, with parking restrictions being a common result for the streets immediately around the station. I’ve pulled out the stats to compare zone 1 (which often has good quality feeder tram services, and sometimes very little parking) against the zone 1+2 overlap (where feeder services are often not that great, and until this year many people would drive to avoid paying a two zone fare) against zone 2-only stations. I have excluded CBD stations from these figures, as I’m more interested in suburban station access. CBD access is heavily skewed towards walk and tram. The total number of boardings (excluding CBD) was 474,820, which gives an indication of how many individuals use the train system each day, though of course people heading to some locations outside the CBD would be counted at least twice. Access to the station by train means people changed from another train service. It’s interesting to see the large number of train interchanges in zone 1 but outside the CBD. Unsurprisingly the number of people driving to the station in zone 2 is higher than in zone 1, but even in the outer suburbs, the non-car modes outstrip car. Bus access is quite low in zone 1, perhaps reflecting that many feeder services tend to be trams. Tram usage barely rated in zone 2, but wasn’t actually zero — there were 363 people counted, all at Box Hill! Due to the way the zones worked, most of these people might have been catching a train outbound from home. These numbers are for 2013-14, before the 2015 zone changes. I’ve known friends who could have walked to a zone 2 station but chose to drive to zone 1, so it’s likely that these figures will need an update once newer data is available. Feeder services into zone boundary were also disadvantaged. Often the train fare to the City was zone 1, but the connecting bus was zone 2. This is no longer an issue. Some early figures available from PTV suggest this has led to a drop in patronage at zone boundary stations, in favour of those further out, as they no longer cost more for the trip into the city. For instance, Laverton dropped by 22%, with Aircraft up by 56%, though I’m told by locals other stations have jumped in patronage too. It’s worth remembering that Park And Ride is extremely expensive to provide. Ground-level spaces cost on average around $17,000 per space. Multi-level is extraordinarily expensive, with Syndal station’s new multi-level car park coming out at $43,200 per additional space provided. That’s 5,744 daily fares, or, based on 250 trips a year (which might be typical weekday usage), 23 years worth. That of course doesn’t count any additional revenue to run or improve train services. Metro’s idea of prefabricated structures might being the cost down a bit, but it’s likely to still be an exorbitant way of getting extra people onto the trains. Some park and ride will always be needed in the outer suburbs, particularly for stations that serve passengers coming a long way from home just to be able to catch a train. But many passengers are only coming a relatively short distance to the station, and to serve them it would be far better to improve feeder services from the surrounding areas, as even the biggest car parks fill up at morning peak hour. Better feeders all day mean even those travelling after peak hour can get to the station. And indeed, those who don’t or can’t drive. And after all, you shouldn’t need to be able to drive to be able to use public transport. Should station parking be free? ← Previous Previous post: The Five Group Railway – good or bad for passengers? Totally agree that park and ride is very expensive for what it provides. A point that often gets missed though is that carparking is almost all a one-off capital expense and has low ongoing operational costs. Feeder busses need operational funding this year, next year, the year after that… for ever… Whilst one year of bus operational funding looks cheap compared to millions for a car park in the long run it presents an ongoing funding challenge for a government. This is the problem politicians and treasury see when car parks and feeder busses are compared. We need to think about how to address this or we will keep getting huge car parks. Anyone got any bright ideas on how to do this? I think the reason “car” is surprisingly low in Zone 2 is that “car commuters” drive all the way to their destination. Once they’re in the car they listen to Red Symons while stuck in traffic in preference to parking at a station and having to wait for a cancelled train in the freezing cold. I paid $50 and use Parkiteer. A cage the size of a small truck holds at least 30 bikes. I love that I’m part of the 1%, but would hope that percentage would increase in the future. I’m sure more people would cycle to a station if there was a safe place to leave their bike. On the Werribee line there are few Parkiteer cages other than at the major stations and bikes are stolen or damaged where there are few or no facilities. The Parkiteer and locker system isn’t actively managed by anyone and many are full. Or at least the maximum number of cards have been allocated (some people with cards don’t use them). There are 8 lockers at my station and I have never seen anyone use one in many, many years. So we lock our bikes to the rails and hope it’s there in working order when we return. It would be a lot cheaper to build bike parking than car parks I assume. I know buses cost money to run and are therefore (eventually) more expensive than providing parking spaces, but the cost of owning cars is also being borne by the community – it’s just borne by individuals rather than all of society. It should be considered in some way when PTV is deciding what to do. The cost of car ownership reduces the amount of money individuals can spend on other things in their community, such as shopping at local businesses, so its economic effect shouldn’t be ignored if we’re doing things properly. That’s a beautifully lit photo, by the way. @Paul, a standard parkiteer cage holds 26 bikes. I wonder what the ongoing costs of maintaining a multilevel structure like Syndal would actually be? @Philip, it is a beautifully well-lit car park photo. But I can’t help but wonder why the emergency cabinet faces into the garden towards the roadway. Is it meant to provide easier access to the fire emergency vehicles (pumpers) that might get parked on the roadway during emergencies? If so, why isn’t there a concrete path in front of it? ? I have been watching construction of the Syndal multi-level car park as I pass in the train each morning, and I have to wonder why PTV chose Syndal when it is just over 1km from the end of the line at Glen Waverley. I believe that it is the end-of-line stations which collect the majority of car drivers who have to drive some distance to their nearest station because their own area doesn’t have and never will have a train or tram line. I live in Scoresby which is 8km beyond Glen Waverley, our nearest station. I have to drive to the station and park in a residential street 800m from the station because the alternatives are just not practical or time efficient. The drive is 10-15 minutes and the walk is about 7 minutes. Alternatively I could travel by bus; it is 15 minutes walk downhill to the bus stop, and a 25 minute ride on the bus, not allowing for waiting time (up to 15 minutes in peak), traffic conditions, and the number of times the bus might stop for pickups. In the evenings the frequency of services is less, and the walk at the end is uphill. The other alternative is bicycle, because there is a Parkiteer facility at Glen Waverley, apparently little used. I did research that on a day off and it took 45 minutes – I am over 60 and there are a lot of hills. It would be wonderful if the Monash Council would come to the party instead of actively discouraging commuters. They have a free multi-level car park 100m from the station which I believe sits half-empty all day but on which the Council has imposed impractical time limits. Bike parking – many of the Parkiteers are very well used. Is it Laverton that now has three of them? In contrast the older bike lockers should probably be phased out in favour of Parkiteers, as the lockers take up a lot of space. @Philip, thanks – the photo was a snap at Tarneit last month with my phone to post on Twitter. Pure luck it came out so well! @David, the rule of thumb for roads is that maintenance costs 1% of the construction cost per year. I don’t know if that could be applied to car parks, but if it was, that’s another $432 per year per space – about 25% of a Yearly fare. @Peter, that’s a good question. I’d assume there’d be space at Glen Waverley… though there was a revamp at Glen Waverley recently, wasn’t there? Something to do with apartments near the station? The comments here do emphasise that people won’t use the buses if they offer a poor service. For me, I walk the 1km or so to my local station. I am known to do that trip back home after midnight every now and then. I have never had a problem. We need something to boost the trainlink bus routes, especially of a morning where people are so concerned about getting to the train, and when the bus network seems to have yet woken up for the day. There needs to be a better promotion of feeder and trainlink buses too. A simple map of bus routes to/from each respective railway station, especially for outer areas such as Cranbourne, Berwick, and perhaps Lilydale and more. That way, we help to encourage more people to use the bus, and less who need to drive to the station each day. I don’t think they’d fit a multi storey car park on the land available at Glen Waverley station – the current parking is in quite narrow, long stretches.. Also not a great use of space given how urban and pedestrianised the area around Glen Waverley station is. Syndal has a huge amount of space dedicated to car parking – plenty to convert some to multi storey. Even though it’s just down the road from Glen Waverley, it is much more car-centric with not much to walk to nearby. @David. Not a problem at all. A capital cost is simply represented by the interest that you’d pay each year on the capital. If desired you’d then add the depreciation and maintenance. This gives the annual ‘cost’ of a large fixed asset. Of course, you’d have to remember that the car park has a relatively small capacity – it’s probably only equal to a couple of buses. Their conclusion? Table 5.4.3-7 gives some ‘typical’ costs (although they note the costs vary greatly). An urban 3 level car park built where land was $1.2 million per acre gave a total annual cost per car spot of $2,844. This was made up of $315 for the land, $1954 for construction, and $575 operating and maintenance. Interestingly, a surface level carpark was only marginally cheaper ($2062 per car spot per annum). This was because, while the construction costs were cheaper (about 25%), the land costs were far higher. Don’t forget there’s an opportunity cost for the land underneath the carparks. You could get a sense of that by figuring out how much an equivalently-located parcel of land is valued in terms of its combined council rates + land tax per year. Keeping it in government hands and providing it “free” (actually, taxpayer subsidised) to commuters costs around that much every year, PLUS whatever the carpark construction/maintenance/replacement costs are. Even if it’s retained by for public use, there’s other facilities probably of higher value than carparking – libraries, parks, community facilities etc that may see on average much more than the 1 person per 6 square metres (plus accessory space) per day that a car park gets. Laverton has 2 cages according to Bicycle Network but these are full and there is a waiting list. Most of the Werribee line has full cages. The PTV site lists outdated information about bike parking (Don’t expect to find hoops at my station, they were removed many years ago)! misguidedjenni the parkiteer cage on the north side of Laverton has very few bicycles in it during the day. All the cards may be allocated but it seems only two or three people are actually using them. I think the one at Williams Landing is chock-o-block. There has been some rumours on the social media grapevine of thefts from the cage itself. Imagine how much easier this would be if people would just leave your bike alone when you park it. According to the Parkiteer website, once you have a card you an access any bike cage cage on the network. Hence if cards aren’t being issued for your local cage, just say you live somewhere else, and get your card that way? Rod there is no easy way to get a bike to the northern cage at Laverton other than via the lifts. I can see why people don’t bother. And yes a bike was stolen from the cage a while back. Marcus wouldn’t you have to use another address? :/ Could be tricky! Looks like there’s a way to the northern side of the station via Merton Street and a path under the freeway? Might not be too far, particularly if coming from east of the station. 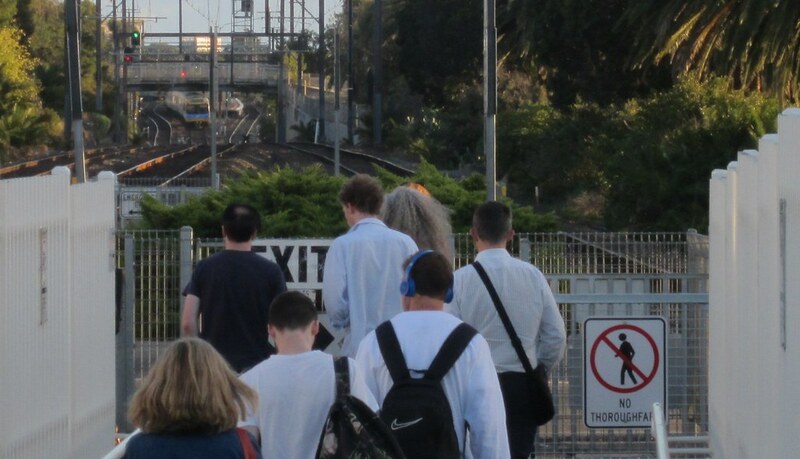 Many locals simply cross the tracks under the freeway at Laverton to get to the northern side. It’s a common spot for near misses. Access from north to south is almost impossible in this entire suburb, and the botched station upgrade should’ve addressed this but didn’t. The main issue with commuter car parks is that the utilisation of the asset is quite inefficient as commuters quickly fill up the car park in the morning and don’t leave until after 5 pm. This leaves little opportunity for other train users such as shoppers and other users to utilise the carpark which also lowers demand on the trains in off peak times when they have plenty of spare capacity. A frequent bus service on the other hand allows non peak users to get to the station encouraging better access to the stations utilising the trains and car parks more efficiently not just in peak times. Wow high numbers of people walking to all the stations in all the zones. Improving walk connections has got to be cheaper than providing more vehicle parking spaces. Often the large car park area is a barrier in itself to walking. @Ellen, I agree. Simple changes to the pedestrian catchment area could have big impacts- even better signage! But mostly adding a station gate at the other end of the platform, working with the local council to improve nearby pedestrian crossings, prioritising pedestrian ‘desire lines’ approaching stations instead of car movements, etc.